It’s pepper time in our neck of the woods. The summer’s presented us with a few heat waves, and while that might not be all that pleasant for us, it is for our local produce. When making a dinner of stuffed peppers, you may want to wait for a gap between hot days. Who wants to turn on the oven when it’s 100 degrees F outside? Certainly not me, but even on a warm day, this is a quick to prepare dinner, with a minimum of oven time. 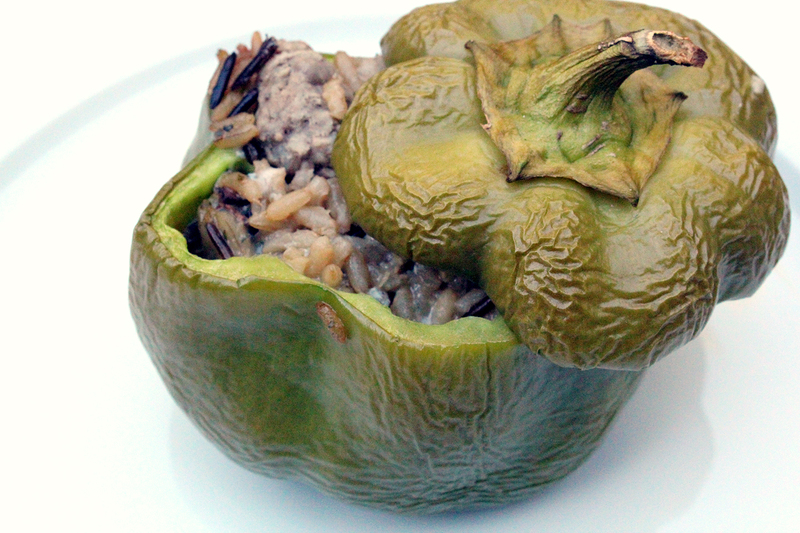 What goes well with green bell peppers? I thought sausage mixed with rice pilaf and some blue cheese seemed like just the ticket. Then I paired dinner with a Cabernet Sauvignon, one with a bit of bell pepper characteristic but not too heavy on the tannins. It was a good match. ***One other thing, you’ll have stuffing left over. Save it for the next morning, scramble some eggs, mix it all together, and make into a frittata. Waste not, want not! Warm a skillet over medium heat and cook sausage. Set aside. Cook rice pilaf to package directions. Stir together pilaf, sausage, and blue cheese. Stuff mixture into each pepper until nice and full. Set tops of peppers back onto the rest of the bell. Place peppers onto a wire rack set into a baking pan and cook for 30 minutes. About 20 minutes in, take the pepper tops off and set onto the rack in the baking sheet so the stuffing browns a bit. Remove pan from the oven and let sit about five minutes. Place peppers on plates and serve. Miss me? I’ve been pretty busy with some house hunting/packing/moving of late. Dinner usually comes after a long, exhausting day, and I’ve been gravitating to a few standbys to get me through the evening cooking process. I’m going to give you the low down on how I cook healthy meals while being super swamped, but for today, I have slightly fancier fare. Nectarines have just come into season in California. They’re one of my favorite fruits, and I love to incorporate them into both sweet and savory meals. I decided to take them and some other in-season ingredients and plop them on some filo dough for a crispy — though rather messy, dinner. I discovered this meal in its open-faced layout required a knife and fork to eat it. If you’d like something a bit easier to eat, fold over the filo into square or triangle pockets so you won’t need a knife. (You’ll just need to add the arugula before folding.) Either way you go about it, pair with a rosé, and enjoy a quick meal after a long day. On a cookie sheet lined with parchment paper, roll out the 8 sheets of filo dough. Drizzle, or spray if you have an oil sprayer, a fine layer of oil over the filo. Spread the ricotta in a nice, even layer, followed by the dollops of goat cheese. 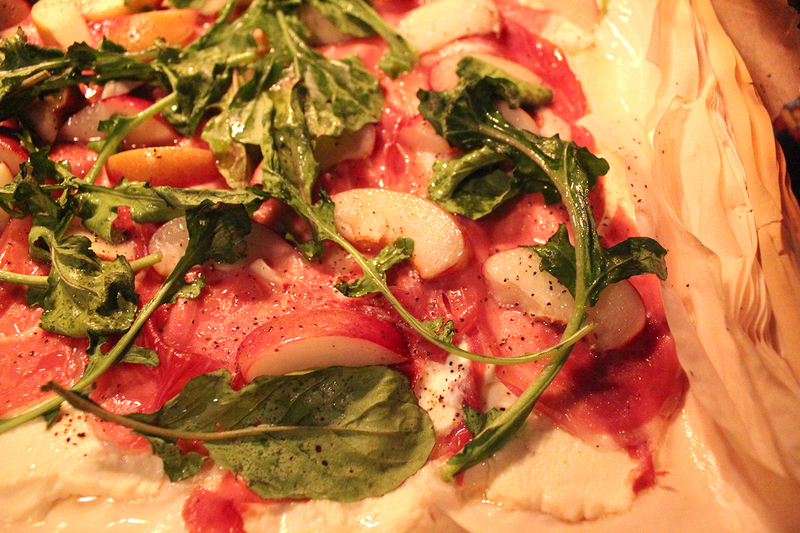 Lay the prosciutto evenly over the cheese, followed by the nectarines. Drizzle or spray a little more oil and sprinkle with freshly ground black pepper. Cook for about 10 minutes or until the edges of the dough turn golden brown. Sprinkle on the arugula and return to the oven just long enough for the arugula to wilt, three to five minutes more. Remove from the oven. Let sit for five minutes, then cut with a pizza cutter into eight pieces, and serve. Today’s post is a quick one, as every spare moment has been filled with busy work this week. I’ll be telling the whole tale on my other blog, but for now, why don’t we take a break and enjoy a superb salad? 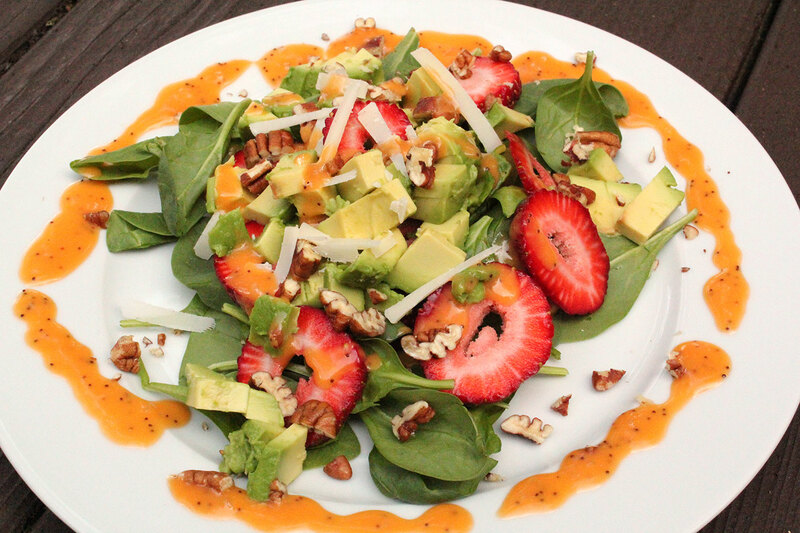 There are a lot of strawberry spinach salads out there, and for good reason. They’re a wonderful mix of flavors, and they’re good for you, too. Mine has the protein upped a notch with the addition of pecans and thin slivers of Pecorino cheese. After a little drizzle of papaya poppy seed dressing and a glass of rosé, this salad was ready to be a sensational supper. Arrange the spinach on two plates. Layer the other ingredients. Drizzle the dressing and serve right away. About a gabillion years ago (okay, maybe closer to 10) I worked in a coffee house. We baristas also served food, things like toasted bagels and cream cheese, blueberry granola, and soup. 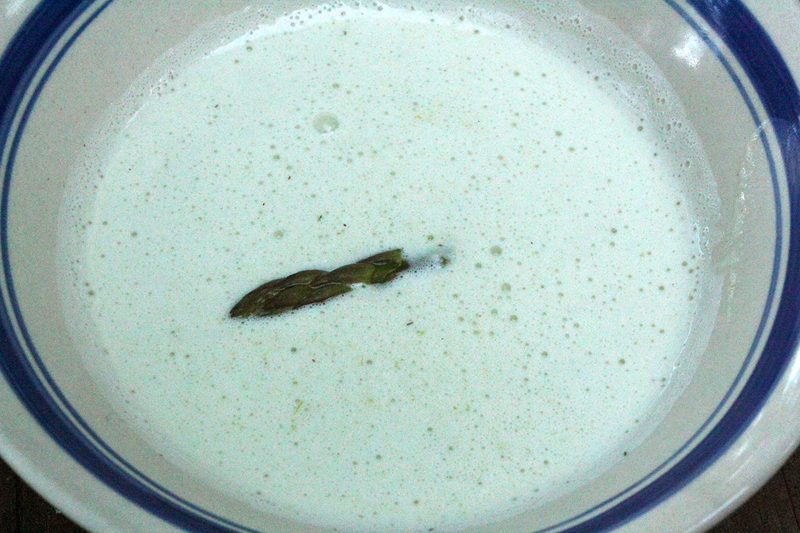 I fell in love with the cream of asparagus soup we served. It was an interpretation of the Moosewood Cookbook recipe and was made in large batches by my boss. This was my first introduction to, “Hey, vegetables can taste amazing as soup!” Before that, I was mostly about salads, and as a starving college student, I honestly saw most veggies as something above my income level. But here we were. This soup was amazing, and I wanted more! I had graduated from college (again) and was working two jobs, one at the coffee shop and one at a grocery store. Not only was I able to afford creating something I considered fancy, I worked at a place where I could get part of it for free. The perks of working in grocery mean that you never starve. Keep that in mind, college students! I got a bunch of asparagus that was too old and ugly for the buying public, as well as an onion that had seen better days, and was on my way to making my first batch. Full disclosure — this soup was part of the first meal I ever made for Charles, and my first attempt at making it, so it has a very special place in my cook’s heart. These days, I only work in grocery, and my position is a bit higher up the ladder. The coffee shop, though I still miss being a barista, is long gone. While the shop may be a thing of the past, I continue to think this soup is all that. It’s tasty and filling, and it’s a great first course or even a good meal, depending on how hungry you are. Serve it with a Sauvignon Blanc, though in my opinion, it’s best to stay away from the gooseberry characteristics of a New Zealand style. Oh, and even though I no longer take advantage of the free for staff as often as I used to, that doesn’t mean I’m not still frugal. This batch was made with the leftover asparagus after my naan pizza creation. The best way to save money when buying food is to eat all of it. In a pot over medium heat, cook asparagus with onions and butter. When the onions are clear, about eight minutes or so, sprinkle in the flour. Lower the heat to low and continue to cook for five to eight more minutes, stirring often. Add stock, salt, dill, and white pepper and cook about ten more minutes or until thickened, stirring frequently. Puree the mixture bit by bit with the milk in a blender or food processor. Blend until smooth. Return soup to low heat until it begins to bubble. Sometimes, I marvel at the world we live in, where we can get tasty, vitamin-packed veggies out of season. I started the week off on a less than healthy note, eating Chinese take-out for two days straight. I had neglected my usual grocery shopping the weekend before, so before take-out, I think we ate something like frozen cheese pizza. These things happen occasionally, but man was my body screaming for fresh food after that stint! Wraps are always good for containing a great deal of vegetable goodness in an easy-to-eat format. To turn our veggie consumption up to 11, I made a side of green bean fries to go with it. We paired dinner with a Pinot Noir. There was just enough fruit in the wine to be a nice companion to the roasted red bell pepper and tomato, plus the lovely mineral characteristics were great with the mushroom. Turn oven to 400 degrees F.
Bring a pot of water to a boil. Cook green beans until they turn bright green. Drain in a colander. Toss with olive oil and Parmesan. Spread onto a cookie sheet and cook until the beans — and Parmesan — just begin to brown, about as long as it will take you to assemble your wraps. On two plates, place spinach wraps. 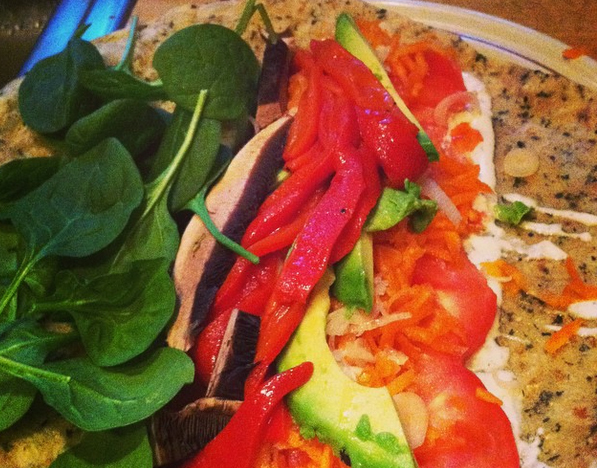 Add condiments, and then layer up the vegetables, staying to just right of the middle of the wrap. Turn the plate so the right side is now the bottom. Fold in the sides of the wrap. Using your thumbs, fold the bottom of the wrap over the veggies and then slowly roll until the vegetables are fully encased, making sure the sides stay in as you go. 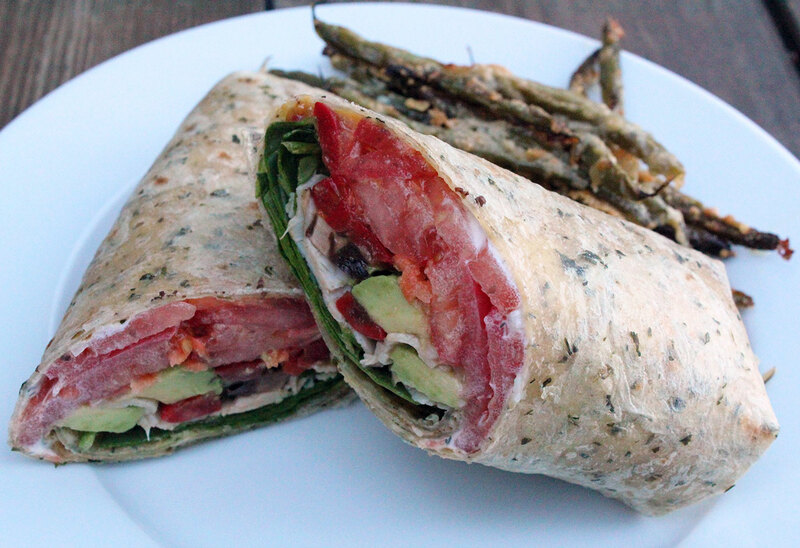 Cut the wrap in half, add the green bean fries, and eat right away. We’re a home of many stir-fries. There are usually vegetables in the crisper as well as the freezer, and a stir-fry is both easy and nutritious. And it’s a quick dinner. Sometimes, though, a little variety is desired. Kimchi seems to be growing in popularity in the States. BuzzFeed even did a list-of-things-you-can-do-with-it article. Like sauerkraut, it’s a fermented food, and it’s versatile in the dishes in which it can be served. Also like sauerkraut, it pairs nicely with Alsace varietals of wine. I paired dinner with a bottle of Corvidae Ravenna 2012 Riesling. Not only is this an awesome wine, because, raven – Charles and I are big corvid fans – it’s really nice. 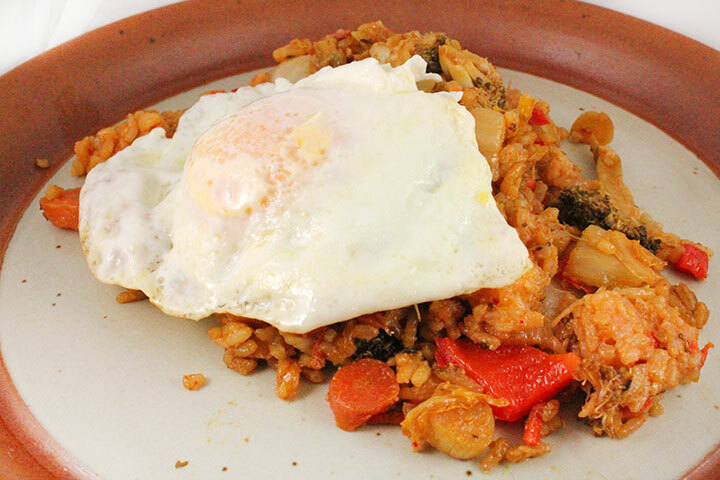 It was a spot on pairing – the Riesling cut through the richness of the egg while making the kimchi fried rice almost creamy and balancing the spice from the Sriracha. It was lovely. Warm a skillet or wok over medium-high heat. Drizzle in sesame oil, just enough to coat the pan. Toss in rice and stir for a minute. Add kimchi and sauté until mixed well and warmed-through. Remove rice mixture and set aside. Add a bit more oil to the pan. Toss in vegetables, garlic, Sriracha, and soy sauce and sauté until vegetables are tender. Turn heat to low and mix the kimchi rice with the vegetables. While the mixture warms and the flavors incorporate, heat another pan over medium-low and cook eggs. Divide the rice mixture evenly onto four plates, top with eggs, and serve. The words, “pasta bake” have been floating around my head for the past month. Pasta! Cheese! Creamy sauce! How could I go wrong? While I wanted to make this Mediterranean casserole of gooeyness, it wasn’t until I saw a post on “veggie crumbs” on epicurious that my desire became a must-happen. I mean, it’s easy to find gluten-free pasta these days, if that’s what you need, but an extra serving of vegetables in the form of crumbs? You had me at food processor. 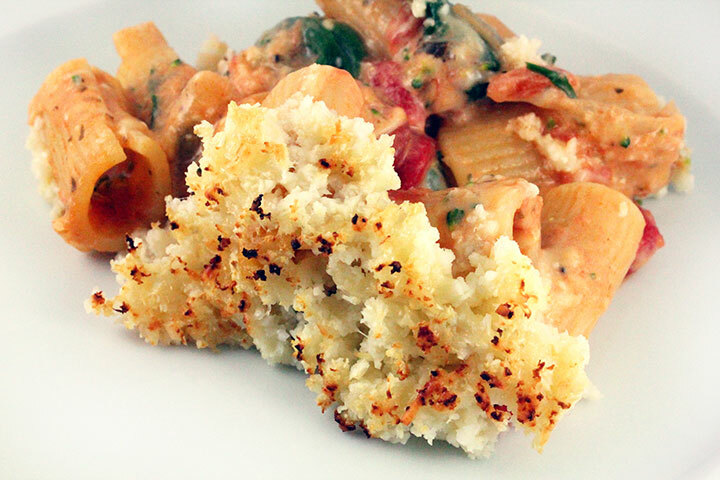 A pasta bake is also an amazing vehicle for vegetables of all sorts. I packed a head of broccoli, 4 cups of baby spinach, and 2 cups of mushrooms into mine, as well as an entire head of cauliflower for the crumbs. Sure, there was cheese in there too, but, vegetables! There were lots and lots of vegetables! The mushies and light, creamy sauce meant a Pinot Noir was the pairing choice. I chose Husch Vineyards‘ 2010 Pinot. It was scrumptious with the food and amazing on its own. In a processor, toss in florets and Parmesan. Pulse until the the cauliflower is the same size of bread crumbs. Drizzle in a little bit of evoo, and pulse until everything is nicely coated. On the stove top, mix all ingredients together (except cauliflower and Parmesan) in a large pot. Once the cheese begins to melt, turn off heat and run a spoon over the top of the pasta until it’s level. Sprinkle “crumbs” evenly over the top and cook for 22-25 minutes, until hot and bubbly. Turn on broiler to high and cook about two minutes, until the crumbs have turned a golden brown. Remove from heat and serve right away. Have you ever noticed that about a half hour after eating certain foods, you just feel really good? I notice that feeling after consuming sushi, sauerkraut, a ton of veggies for dinner, or roasted beef marrow. What was that last one again? When roasted, beef marrow is a lot like a soft gelatin, golden, full of flavor, and easy to make. Spread it on toast, sprinkle on a few grains of Celtic sea salt, add a side salad, and you’ve got a pretty hearty meal. I was first introduced to marrow during my trip to Milwaukee last year. I thought I’d be daring and try it, and I ended up loving it. It was so simple but so decadent. I was really glad I had been open to trying something new. I paired our roasted marrow toast with Balo Vineyards‘ 2012 Anderson Valley Pinot Noir. The choice of Pinot Noir was excellent with the light beef flavors of the toast. Plus, a good Pinot is always lovely. No wonder my belly was so happy after the meal! In a casserole dish, place bones upright, using the wider end as the base. Roast 15-20 minutes. For really wide bones, more time will be needed. Marrow is cooked when it’s a nice golden color with no pink. Scoop marrow out of bone with a narrow spoon. Spread on toast and sprinkle with salt. Today’s recipe began as a pin on Pinterest. I saw the beginnings of what looked like a pretty tasty – and vegan – meal, only to discover that my pin linked to a different recipe than the image shown. The recipe was not to be found on the blog. Sad face. Anyone who uses Pinterest on a regular basis knows this is a danger, but dang it, I really wanted that recipe! Since I am who I am, I would not be foiled. I would make my own. And it was successful – and so very, very easy, too! This concoction was paired with a Sangiovese, just right with the garlic tang and the avocado creaminess of the pasta sauce. The leftovers were a bit homely, as avocado browns quickly, but it was just as delicious as the first night. Set a pot of water over high heat. Add a pinch of salt, and cook spaghetti to package directions. Drain. While pasta cooks, toss the rest of the ingredients (except tomatoes) in a food processor or high performance blender. Pulse until everything is combined, then run until creamy. 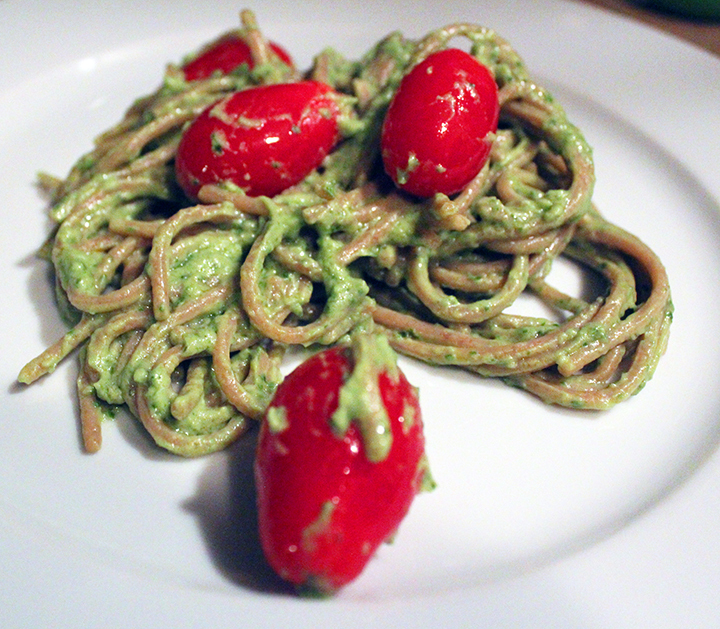 Toss avocado pesto with pasta and tomatoes, and call it dinner. One of my favorite things to do is to meander through the produce department to see what’s freshest that day. I go in without a plan and peruse. Based on what strikes my fancy, I proceed to wander the rest of the store, concocting a dish as I go along. The abundance of summer is over for the year, but there is still so much to be had! I have quite a fondness for winter squash, so I’m never disappointed when autumn begins to show its bright colors and causes us to layer outerwear. Spaghetti squash is a fun one, as it can be used as a substitute for pasta or just tossed with some olive oil and Parmesan for a side dish. I opted for the former this go around the store, and was quite pleased with the result. I added a vegetable marinara sauce, a sprinkle of Parmesan cheese, chard, and some Italian sausage. It made for a hearty supper. To pair, I chose a Teroldego. Its light tannins went nicely with the sausage, and the licorice on the mid-palate was delightful with the fennel that had been ground into the sausage. Side note — get to know your butcher. Our local ones at the co-op create the best sausage. A butcher can introduce you to new cuts of meat, and you’ll always find the freshest options. The Teroldego was also rich enough to hold up to the marinara sauce and really brought dinner to the next level. Preheat oven to 400 degrees F. Cut your squash in half. Drizzle with olive oil and sprinkle with salt and pepper. Put it cut side down on a cookie sheet lined with parchment paper. Cover the squash with either more parchment paper or tin foil and cook for around two hours or until the inside of the squash in tender. When squash is cool enough to handle, use a fork to scrape the “noodles” out of the squash. Drizzle olive oil in a saute pan and cook sausage over medium heat until browned. Add chard and cook until the leaves turn dark green and become tender. 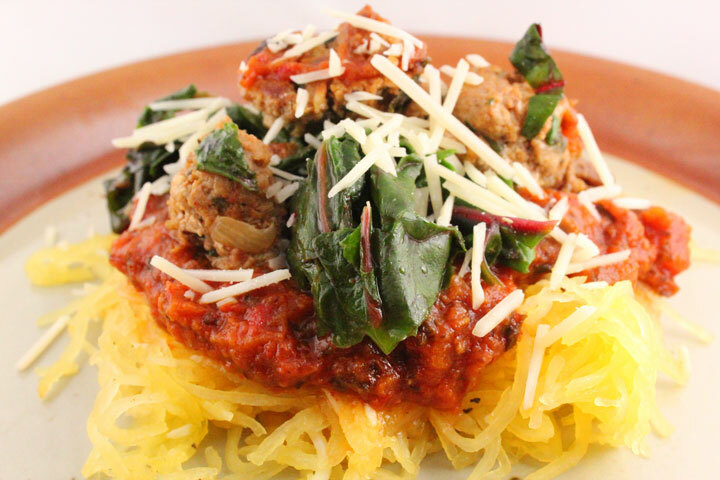 Warm marinara sauce and then either toss everything together or layer squash, sauce, sausage, and chard on a plate. Sprinkle with Parmesan cheese and serve. *If you plan a little, you can always cook your squash in the slow cooker while you’re at work. Instead of cutting it in half, just pierce it with a fork a few times and cook it on low for about eight hours. In my case, with my commute, it would probably be closer to ten hours. Thankfully, the slow cooker is forgiving.